Full Name: John Emmet Lyle, Jr.
(1) Not present at organization of the House on 1/12/1943. Oath of office administered on 2/11/1943, p. 379. House Journal. (2) Lyle resigned 4/11/1944. Members of the Texas Congress 1836-1845; Members of the Texas Legislature 1846-2004, 2005. 52nd Legislature, R.S., SR 43, 2/15/1951. Resolutions - Congratulatory and Honorary. LYLE, John Emmett, Jr. (1910-2003). Representative, TX. Biographical Directory of the U.S. Congress 1774-Present. Mentioned in "Lawmakers Pondering War, Duty," 2/27/2003. San Antonio Express-News. Pictured in uniform in the 48th House composite photo. State Preservation Board. United States Army, Private, Second Lieutenant. "In the beginning of World War II, in 1942, he volunteered and took his basic training as a private in the Army. He was sent to Officer Training School where he graduated as a second Lieutenant. He was then assigned as a platoon leader to an Automatic Weapons Battalion in the 536th. That battalion was quickly sent to North Africa where he experienced combat as well as in Malta, Sicily and Italy. 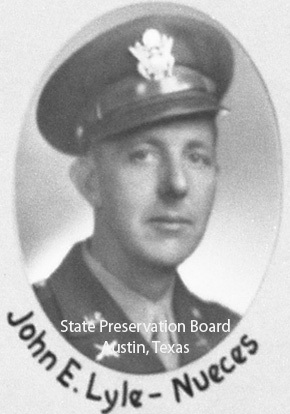 He was awarded a Purple Heart in the Anzio campaign and while serving as an infantry officer in the Arno River campaign, he was nominated and elected to the U. S. Congress for the fourteenth District of Texas." Texas State Cemetery. Memorial, January 2004, p. 72. Texas Bar Journal. Lyle, John Emmett. Texas State Cemetery.